Dr. Romeo E. Ramos lives in Martinez with his wife, Arlene, and their three kids: Lauren, Matthew, & Daniel. When he is not in the office, Dr. Ramos enjoys numerous outdoor activities and sports, including basketball, boating, fishing, wakeboarding, camping, and swimming. He is also the number one fan of his kids when they play softball, baseball, basketball, and football. Dr. Romeo Ramos leads a dental team of professionals who share the same belief of taking care of your personal and individual dental needs and preferences. 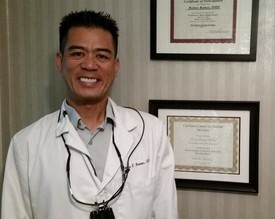 Our dental assistants are certified, licensed, and registered in the State of California. Our dental assistants will also help assists in giving you comfort and understanding of the dental procedure being done. We are all committed to bringing you an optimum oral health in a warm and comfortable environment.